For those of you who are long-time readers of this blog, you already know: a cappella music is something I love. 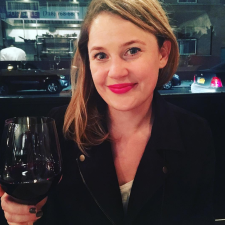 Based on this, you can only imagine my delight at having the chance to reconnect with Janine Perry, campus representative and technology liaison for the Wheaton College Wheatones, the group I used to sing with (so many) years ago. 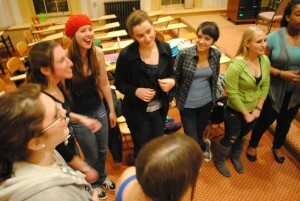 A bit of background: the Wheatones is the oldest all-female a cappella group at Wheaton. In the last 10 years, the a cappella scene has exploded on campus with the launch of groups like The Blend and Voices United to Jam. Add to this the Whims and the Gentlemen Callers, and you’ve got five groups in total, which makes for an impressive array of vocal talent on a campus with just 1500 students. Here, Janine talks about the Wheatones’ most crowd-pleasing numbers, and explains why the community aspect of singing is her favorite part. How would you describe the a cappella scene at Wheaton? It’s really strong. With five groups, almost everyone on campus has a connection to someone who sings a cappella. At Wheaton, the a cappella groups are almost like fraternities and sororities. Our work is creative and productive and we have a lot of fun, too. What do you love the most about a cappella? The community. You not only have a group of friends to start off with at Wheaton and stay with until your departure point, you’re also able to interact with the members of the other groups. This year, we actually arranged a song to perform with all five a cappella groups on campus. It was Britney Spears’ ‘Till the World Ends. It was a mess, but it was so much fun to get together and collaborate. Tell me about SLYPE — it’s basically a cappella initiation at Wheaton, right? It’s one of the most fun nights of the semester. It takes place when we hold auditions. We hear so many wonderful voices, and then we get to welcome a new friend to the group. At midnight, once we’ve made our decision on who we’re going to accept, we pull the girls out of their dorm rooms, run around campus screaming, and sing together under the archway on upper campus. Everyone comes out to watch. Is the audition process still pretty rigorous? Yes! First, the girls have to sing a song of their choice, then they have to sing scales, and repeat melodies from memory. It’s always a bit scary. You can tell the girls are really nervous, and it’s always difficult. But the ones who are meant to get through do. Do you remember the song you auditioned with? I tried out after transferring to Wheaton in January of my sophomore year. I sang a song called “The Garden,” by Mirah. Was a cappella something you always wanted to do? My audition was actually the first time that I sang in front of anyone, other than the person I was dating at the time. I didn’t wear my glasses so I couldn’t see anyone when I was singing. What are the Wheatones’ most crowd-pleasing numbers? One of our biggest hits has always been “Gangster’s Paradise,” mostly because it’s so unexpected to see girls singing rap. We also just started performing “Stacy’s Mom” by Fountains of Wayne and “C’est La Vie” by Bewitched. Both seemed to go over really well! Who are the a cappella groups that you’re listening to right now? We just performed with Fermata Town. They’re a post-collegiate group, and they were really excellent. The Dartmouth Aires are also fantastic. We performed with them in 2010, and they were so incredible. Then, of course, they went on to become nationally recognized thanks to The Sing-Off. We were so proud! A cappella continues to make numerous appearances in pop culture. Is there a TV show or movie that you think gets it right? I don’t really know. I don’t even watch Glee. A few of the girls in the group do. It is cool that it makes people more familiar with what we do. That way, when you tell someone that doesn’t sing in an a cappella group, they have a general idea of what it’s like. It makes people more interested. Catch a live performance by the Wheatones at the Commencement Reunion Concert this Friday, May 18.